One of the problems with the web is that the quality of information is variable, and it is necessary to give sites a "credibility check" before placing too much confidence in their contents. This section is intended to provide the reader with some of the background to the development of the site, so that he may make his own judgements. 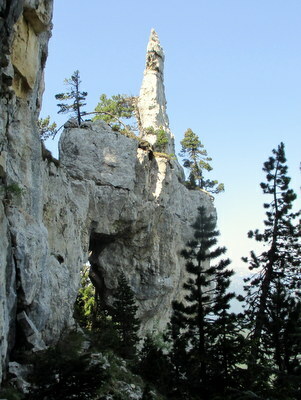 The author first visited Chartreuse in 1968 as a member of a university caving expedition to the Cirque de St. Même area. His second visit was in 1980 when he went caving within the Dent de Crolles massif. Since then, he has visited the area every couple of years for two to three week long holidays, mainly walking but also including the occasional caving trip. He has spent in total well over a year in the area. Visits have been confined to the period between late May and September. This site was first developed in 1998, and has since been continually reviewed and enhanced as a result of further visits to the area, feedback from readers, and the availability of enhanced technology (of which there have been quite a few since 1998!). The last significant update was in July 2018, although the site was redeveloped in February 2019 to allow for responsive CSS technology. The author is confident in the accuracy of most of the information contained herein. The walks on the hills don't change much, but the Regional Park Authority is investing in new car parks, and sign-posting, so that level of detail can change from year to year. Forestry is also on a more industrial scale than it used to be, and some of the traditional paths on the lower slopes of the hills have been ruthlessly destroyed by forestry tracks. Readers are often kind enough to let him know of any inaccuracies or ambiguities they find. The availability and prices of maps and literature is checked as often as is practical from web-based sources, and all hyperlinks are checked regularly using an in-house developed PHP transaction. The Club Aqualien de Spéléologie et d'Alpinisme web site. The pistehors.com site for backcountry skiing and snowboarding. ScanMaps – a Danish provider of maps and books: "en hjemmeside med rigtig mange gode turbeskrivelser og links til andre klatre - og vandresider." Franceonfoot.com – a web site that does what it says on the label: "a thorough and informative [site] dedicated to walking in the Chartreuse region... This is a fine source of information for the walker." A Dutch walking site – "Een Engelse site met veel informatie over dagtochten in de Chartreuse is ook zeer de moeite waard, met schitterende foto's." A Dutch PDF file devoted to sangle walking says: "behoorlijke complete Engelstalige site over wandelen in de Chartreuse." Les Petits Curieux – a site devoted to the Grenoble area: "Randonnées en Chartreuse et en Anglais. Très précis." Villa Marie-Louise – a web site for accommodation near the centre of St. Pierre de Chartreuse: "There is a wealth of information on the internet about walks in the region, including the comprehensive Walking Guide to Chartreuse by John Gardner available at http://www.braemoor.co.uk/chartreuse/." La Grange – a web site for a local gîte owned by Norman Clark: "A superbly informative UK site which describes many walks in the Chartreuse." Keyhole Caving Club (link disappeared) – "an invaluable and well-researched resource." Henck Joly's world wide walking portal: "A very complete and well presented description of this area." The Virtual Tourist – a site that allows users to provide their comments on an area: "Here is a site that has a lot of information." La Chartroussine – a web site for a local gîte owned by Philippe Locatelli: "A superbly informative UK site which describes many walks and the geography of the Chartreuse. A must to visit." Slackpacker – an American hiking web site owned by Rick Bolger says somewhat grudgingly: "Site is quite informative." An entry in the rec.climbing.uk forum by Martin Carpenter says: "This anglophone site is excellent for Chartreuse." Andy Bryant is based in Grenoble and has a hiking web site in which he says that this is "an extensive walking guide to the region." Comments from readers may be found in the Guest Book. This site uses HTML5 and makes extensive use of responsive Cascading Style Sheet technology, and hence assumes a reasonably modern browser. The CSS and HTML code is validated using the W3C markup validation service. Links are regularly checked using the author's own link checking tool. The Guest Book was developed by the author, and is written in PHP and MySQL, and has had to feature strong antispam measures. The Photograph Album software was also developed by the author using PHP and XML. The responsive menu seen on smaller screens has been implemented using the amazingly powerful Slicknav plugin developed by Josh Cope. I would like to thank Dave Checkley, Peter Monk, Stuart Hesletine, and Graham Coates for the use of their underground photographs taken in the Grotte Chevalier, the Grotte Annette, the Guiers Vif, the Trou du Glaz, and the Guiers Mort, and also for their company in those caves. I would also like to thank John Sellers and Peter Schuller for the use of their photographs, and a number of correspondents who have been kind enough to comment constructively on the route descriptions. Finally, I would like to thank my wife, Mary Carlisle, to whom this web site is dedicated, who has been the perfect companion on our walks, and who loves the area as much as I do. John Gardner owns the copyright in the computer files that comprise this publication. Additional copyright in the text, photographs and images may reside with other authors as indicated. The copyright owners assert their Moral Rights under the Design, Copyright and Patents Act 1988. Reproduction of part or all of the contents of any of these web pages is prohibited except to the extent permitted in this notice unless prior agreement has been obtained from the copyright owners. You are welcomed to download these web pages onto a hard disk or print them for your personal use. You are NOT permitted to use any of the pages or parts of pages in any other work or publication in whatever medium stored. No part of these pages may be distributed or copied for any commercial purpose. See here for a copyright fact sheet from the UK Copyright Service.